Let’s start with the best bit of all: this is a beat box with a TEEN rhythm! Seriously, you can’t get better than that. It’s hardly worth going on. Slide some Brylcreem on your comb, pop your leather jacket on, and fire up that motorcycle, bad boy: teen rhythm’s gonna getcha! 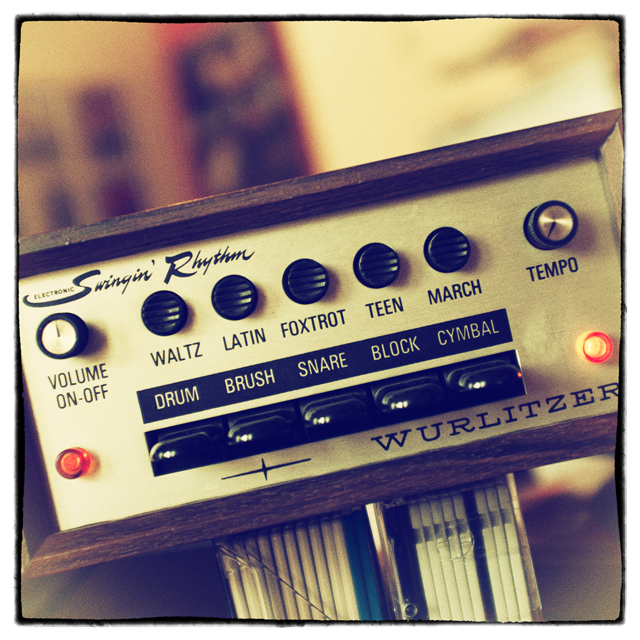 But there’s more to the Wurlitzer Electronic Swinging’ Rhythm (to give it its full name) than the world’s best preset rhythm name. It is, in essence, a Wurlitzer organ add-on, intended to bring preset rhythms to owners of Wurli’s well-regarded range of home organs. As such it has five basic rhythms, adjustable for tempo, but – interestingly – also five funny little black tongue-depressor-style switches that trigger the sounds individually. Plenty of preset rhythm machines left this extra level of control out, so it’s nice to see them here. The “Snare” switch also has a trick up its sleeve: when pressed momentarily, it triggers a single snare sound, as you’d expect; but when held, it pumps out a snare roll, bringing back all those marching band practices and first-base snogs under the bleachers which we none of us had because we didn’t grow up in the 50s. We’ve kept things very simple with WurliBeat. The original preset rhythms can be engaged either individually or in combination (which can be fun – Latin Teen is a particular favourite around the lab, and not just because it appears so regularly in Mongo’s browser history). A compressor can be dialled in to thicken things up a bit: you can hear it on the first demo, but we left it switched off for the second, which is the WurliBeat “raw”. There’s a convolved IR plate reverb wired in there to give you an authentically dated ambience when you want it, and finally we’ve given the kit pieces level and pan trim pots on the Real Wood Veneer Cabinet. We sampled each kit piece multiple times, and these samples are selected randomly so that WurliBeat retains its authentic analogue character. WurliBeat has a creaky, slightly crackly, varying analogue charm that can add a dose of real vibe to ambient, nu jazz, trip-hop, New Age, ambient house and other laid-back musical styles. 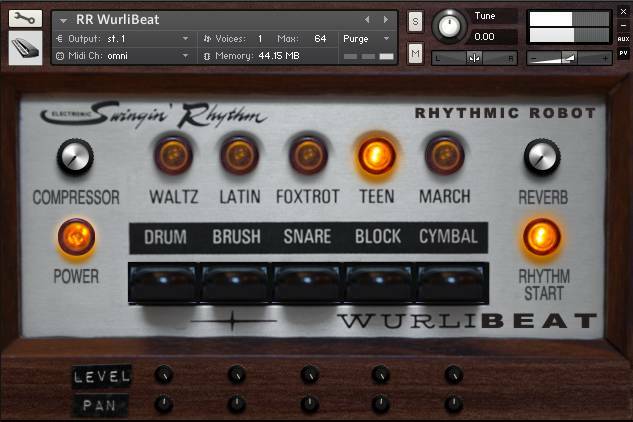 It can also add a deliciously retro element to tracks based on more contemporary drum kits. WurliBeat. Time to take the slow train to chillsville, man. A very nice drum machine, though limited in number the patterns can prove themselves quite inspiring especially when combining several of them. In common with the other old beat boxes I have from RR, you can’t flick from 1 pattern to another on the fly – you have to start and stop. However, that’s only a “thing” when you’re playing it from the interface. Play it via MIDI or trigger it from a DAW and you can do it just fine. And layer patterns. And with this one, add reverb and compression. The interface mimics a real one really well (frankly, how many of us have seen one?!) – check youtube if you don’t believe me. Sounds pretty darn authentic too. All the 5 (whoo!) presets are there from the original and individual samples of each voice, which have level and pan controls, notto leave out they’ve included a snare roll sample to boot. Great price, and this little box has its place. Fantastic, very subtle drum machine. fantastic! use it all the time!